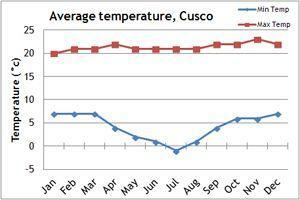 Our climate charts will give you an idea of the weather conditions of Peru. The best time to visit Machu Picchu and the Sacred Valley or complete an Inca Trail trek is between April and October whilst the best time to visit the Andes region of Peru is between the months of June to September. This is the best time to trek in Peru, as the temperature is warm and relatively dry. Temperature is affected by elevation, with temperatures decreasing the higher you go. For example, on our Pisco Peak trekking peak, the mountains will be snow covered even in summer. 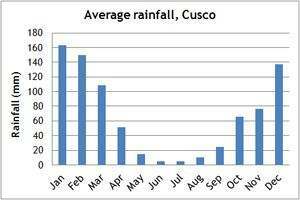 Between December and March, the Andes receives heavy rain, though you should go prepared for it to rain during the summer and be dry during the winter! The jungle is hot and humid all year around, and the rain is heavier than in the Andes. We organise our group holidays to depart during the best time of year for travel. If you can't make the dates of our group departures, then take a private departure on dates to suit you, or we can create a Tailor Made holiday to Peru, especially for you and your family or friends.